According to recent research, the worst case scenario in health coaching is when the practitioner argues for the change while the patient argues against it. This typical scenario in healthcare when a patient is "non-adherent" actually predicts negative clinical outcome - yet it’s the norm now in the traditional medical model. However, there is an evidence-based approach that flips the typical scenario on its head, while predicting more positive clinical outcomes. Motivational Interviewing (MI) is an evidence-based approach, with over 900 clinical trials, either completed or in progress, demonstrating its effectiveness.1 First we’ll quickly introduce the MI approach and provide an overview of the research that supports its efficacy. We’ll explore the underlying dynamics of MI. 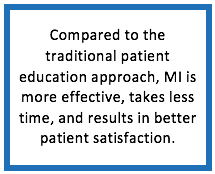 Lastly, we’ll make the case for why MI is an important approach to integrate into healthcare interventions. First described by Dr. William Miller in 1983, MI began as a behavior therapy for problem drinkers, and has since evolved into a much broader patient-centered communication approach.2 More specifically, MI is “a collaborative, goal-oriented style of communication with particular attention to the language of change. It is designed to strengthen personal motivation of and commitment to a specific goal by eliciting and exploring the person’s own reasons for change within an atmosphere of acceptance and compassion. "3 Currently considered the gold standard in addiction counseling, MI has expanded as a popular approach for a spectrum of lifestyle management, treatment adherence, and engagement interventions in a variety of settings, including corrections, healthcare, social work, and vocational rehabilitation. The evocation and reflection of change talk by the practitioner has been shown by recent research to be particularly influential in health coaching sessions.7 Findings suggest that increases in change talk and commitment language are positively correlated with progression in stages of change and improved health outcomes .7-9 There is even research using neuroimaging to demonstrate that change talk processing occurs in the same parts of the brain consistent with self-perception and intentions. This suggests that in treatment sessions where clinicians evoke change talk, they are “tapping into neural circuitry that may be essential to behavior change.”10 In summary, numerous studies have supported the hypothesis that patient language about change (i.e. change talk) does in fact effect the causal chain of MI. 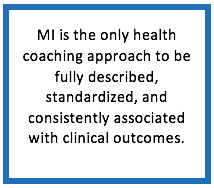 MI is a complex skill set that does not lend itself to the typical “one-and-done” style of training; it takes commitment, planning, and dedicated resources to train medical staff. Like learning a foreign language, it takes practice, feedback and continuous support after the initial training over time to develop proficiency. In addition, policies and procedures in the organization may need to be modified to support the new approach. There are several learning modalities and options available to your team or for individual practitioners interested in pursuing MI as a clinical communication approach. Stay tuned for more on the criteria that should be met for a successful workforce training initiative plus a sustainability plan for integrating MI into your practice or setting. 2 Miller WR. Motivational interviewing with problem drinkers. Behav Psychother 1983; 11: 147–172. 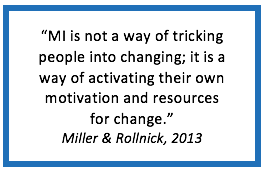 3 Miller WR, Rollnick S. Motivational Interviewing: Helping People Change. Third Edition. New York: Guilford Publ. : 2013. 4 Rogers CR. The necessary and sufficient conditions of therapeutic personality change. J Consult Psychol 1957;21(2):95-103. 5 Miller WR, Rose GS. Toward a Theory of Motivational Interviewing. Am Psychol 2009;64(6):527-537. ​6 Moyers TB. The relationship in motivational interviewing. Psychother 2014;51(3):358–63. 7 Barnett E, Moyers TB, Sussman S, et al. From counselor skill to decreased marijuana use: Does change talk matter? J Subst Abuse Treat 2014;46(4):498-505. 8 Perry CK, Butterworth SW. Commitment strength in motivational interviewing and movement in exercise stage of change in women. J Amer Acad Nurse Pract 2011;23(9):509-514. ​9 Moyers TB, Martin T, Christopher PJ, Houck JM, Tonigan JS, Amrhein PC. Client Language as a Mediator of Motivational Interviewing Efficacy: Where Is the Evidence? Alcohol Clin Exp Res 2007;31(s3). ​10 Houck JM, Moyers TB, Tesche CD. Through a glass darkly: Some insights on change talk via magnetoencephalography. Psychol Addict Behav 2013;27(2):489-500. ​11 Glynn LH, Moyers TB. 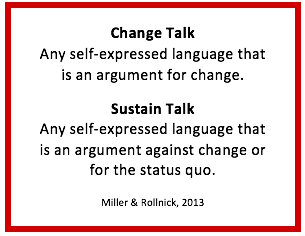 Chasing change talk: The clinician's role in evoking client language about change. J Subst Abuse Treat 2010;39(1):65-70. ​12 Apodaca TR, Jackson KM, Borsari B, et al. Which Individual Therapist Behaviors Elicit Client Change Talk and Sustain Talk in Motivational Interviewing? J Subst Abuse Treat 2016;61:60-65. ​13 Moyers TB, Houck J, Glynn LH, Hallgren KA, Manuel JK. A randomized controlled trial to influence client language in substance use disorder treatment. Drug Alcohol Depen 2017;172:43-50. ​14 Rubak S, Sandbæk A, Lauritzen T, et al. Motivational interviewing: a systematic review and meta-analysis. Brit J Gen Pract 2005; 55:305-312. ​15 VanBuskirk KA, Wetherell JL. Motivational Interviewing Used in Primary Care: A Systematic Review and Meta-analysis. J Behav Med 2014;37(4):768-80. ​16 Hettema J, Steele J, Miller WR. Motivational Interviewing. Annu Rev Clin Psychol 2005;1:91-111. ​17 Canale SD, Louis DZ, Maio V, et al. The Relationship Between Physician Empathy and Disease Complications. Acad Med 2012;87(9):1243-1249. 18 Martins RK, Mcneil DW. Review of Motivational Interviewing in promoting health behaviors. Clin Psychol Rev 2009;29(4):283-293. 20 Johnson DM, Russell RS. SEM of Service Quality to Predict Overall Patient Satisfaction in Medical Clinics: A Case Study. Qual Manage J 2015;22(4):18–36. ​21 Lundahl B, Burke BL. The Effectiveness and Applicability of Motivational Interviewing: A Practice-Friendly Review of Four Meta-Analyses. J Clin Psych 2009;65(11):1232-45. 22 Butterworth SW, Linden A, McClay W. Health Coaching as an Intervention in Health Management Programs. Dis Manage Health Out 2007;15(5):299-307. ​23 Noordman J, van der Weijden T, van Dulmen S. Communication–related behavior change techniques used in face-to-face lifestyle interventions in primary care: a systematic review of the literature. Patient Educ Couns 2012;89(2):227-44. ​24 Wolever RQ, Simmons LA, Sforzo GA, et al. A Systematic Review of the Literature on Health and Wellness Coaching: Defining a Key Behavioral intervention in Healthcare. Globl Adv Health Med 2013;2(4):38-57. 25 Olsen JM, Nesbitt BJ. Health Coaching to Improve Healthy Lifestyle Behaviors: An Integrative Review. Am J Health Promot 2010;25(1):e1-e12.